Your home stands out in a crowd- but what makes it so special? Its that perfect blend of welcoming, comfortable ambiance and chic, fashionable touches. Create a dining set that matches your laid-back style with this upholstered Parson's chair. It's cushioned and covered in a weathered gray fabric with an eye-popping X lattice for the most memorable dinner parties you can imagine. The Music City "Under The Rainbow" Parson's Chair with X-Back by Trisha Yearwood Home Collection by Klaussner at Furniture Barn in the Pennsville, Bear, Newark, Hockessin, Middletown, New Castle, Townsend, Talleyville, Wilmington, Marshallton, Smyrna, Elkton, area. Product availability may vary. Contact us for the most current availability on this product. Nashville is the Music City, and nobody knows it like country music superstar Trisha Yearwood. In fact, the Music City collection was inspired by Trisha's brand new pad in Nashville. The relaxed-meets-glam Music City collection gets its signature look from the Slate and Stone wood finishes. These low-sheen finishes show off the natural grain of the oak wood, creating a touch of country casual feel. 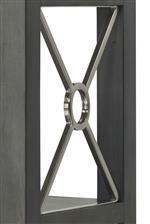 Adding a big city touch to the collection are bright accents of brushed steel on hardware and eye-catching crisscross lattices. It's easy to create casual chic decor with pieces for every room including casual dining sets, living room tables, and two choices of bed. The upholstered bed, bed bench, and dining chairs add a little softness to the mix with upholstery in weathered gray fabric. The Music City collection is a great option if you are looking for Contemporary furniture in the Pennsville, Bear, Newark, Hockessin, Middletown, New Castle, Townsend, Talleyville, Wilmington, Marshallton, Smyrna, Elkton, area. Browse other items in the Music City collection from Furniture Barn in the Pennsville, Bear, Newark, Hockessin, Middletown, New Castle, Townsend, Talleyville, Wilmington, Marshallton, Smyrna, Elkton, area.